HITS has new statutes and new shareholders, Heidelberg University and KIT. Furthermore, the “HITS Stiftung” and a Scientific Advisory Board have been established. New HITS website online. The Heidelberg Institute for Theoretical Studies (HITS) has been structurally reorganized so the institute will continue to run smoothly and evolve continually after the start-up phase. As of January 1, 2015, the non-profit institute for basic research will be headed by a Scientific Director and the Managing Directors. HITS’ first Scientific Director will be biophysicist Prof. Rebecca Wade, her deputy being computational linguist Prof. Michael Strube. Klaus Tschira, founder of the institute, and Prof. Andreas Reuter will remain Managing Directors. HITS’ former main shareholder, the Klaus Tschira Foundation, will be replaced by the newly established HITS Foundation. The main purpose of this foundation is to support the scientific orientation and structural development of the institute as well as to secure the base funding of HITS with the help of the Klaus Tschira Foundation. From now on, HITS gGmbH will also have two academic shareholders: Heidelberg University and the Karlsruhe Institute of Technology. HITS and both universities have been working together closely for a long time. Perfect examples of this cooperation are their joint appointments for new professorships and graduate schools. New: The HITS Scientific Advisory Board. Prof. Dieter Kranzlmüller (LMU Munich, 2nd from left) was elected chair at the first Board meeting. 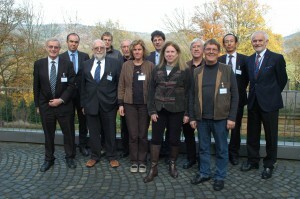 HITS Managing Directors are Klaus Tschira (3rd from left) and Prof. Andreas Reuter (far right). Prof. Rebecca Wade (6th from left) is the first Scientific Director of HITS, her deputy is Prof. Michael Strube (4th from left). New is also the Scientific Advisory Board that will advise HITS on scientific questions and orchestrate a regular scientific evaluation process. Among the ten internationally renowned members is Nobel laureate Prof. Stefan Hell (Max Planck Institute for Biophysical Chemistry, Göttingen, Germany). Prof. Dieter Kranzlmüller (Ludwig Maximilian University of Munich), Director of the Leibniz Supercomputing Centre, was elected chair of the Board in the first meeting. The HITS Foundation and the Scientific Advisory Board are giving HITS a new structure, ensuring long-term support of the scientific goals of the institute – true to the motto: Think Beyond the Limits! 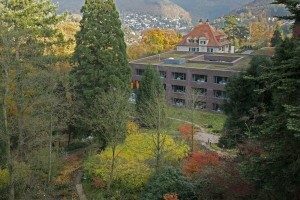 The Heidelberg Institute for Theoretical Studies (HITS gGmbH) was established by SAP co-founder Klaus Tschira and the “Klaus Tschira Stiftung” as a private, non-profit research institute. HITS conducts basic research involving the processing and structuring large amounts of data in the natural sciences, mathematics and computer science. The research topics range from molecular biology to astrophysics. Shareholders of HITS are the “HITS-Stiftung”, Heidelberg University and the Karlsruhe Institute of Technology (KIT). HITS cooperates with universities and research institutes, as well as with industrial partners. The prime external funding sources are the Federal Ministry of Education and Research, the German Research Foundation and the European Union.